A popular escape from city life is provided by the small seaside town of Boca Chica, a 25-minute drive east of Santo Domingo on the Avenida de las Americas. The resort was developed by a wealthy industrialist around one of the best swimming beaches on the coast, and boasts crystal-clear, calm waters, a yacht club and a marina, a golf course and some excellent seafood restaurants. 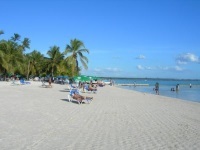 The short distance from the capital city, the crystalline waters and the white sands turned Boca Chica into the most crowded beach of the Dominican Republic, especially on weekends and holidays, as it is only 19 miles (30 km) away from Santo Domingo. Boca Chica has two small islands, La Piedra and La Matica.